There’s been some controversy surrounding the “ideal” 6mm bullet diameter. This is compounded by the fact that 6mm match barrels are available with both .236″ and .237″ land diameters. It has become quite clear to us that bullet diameter is an important variable to consider when choosing the best projectile for your particular barrel. Some barrels prefer “fat” bullets while other barrels prefer “skinny” bullets. There is solid evidence, for example, that skinny bullets like the 105gr Scenar may shoot best in a .236 barrel. German Salazar recently measured a selection of 6mm bullets, recording bullet diameter, overall length (OAL), and bearing surface length. His results are interesting. Some months ago, Jason Baney measured 12 different sets of 6mm Match Bullets, including a couple different lots of the same bullet design. 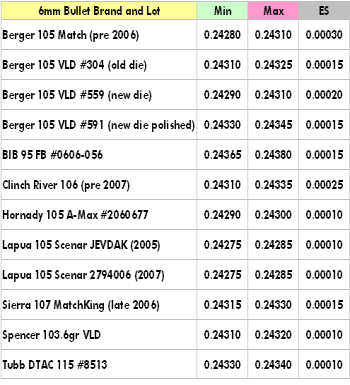 Notice, some bullets measure a bit different, compared to German’s numbers — this may reflect lot variances and/or measuring methods. Interestingly, Jason did measure the “old” Berger 105 VLD, the “new” Berger 105 VLD (first lot from the new die), and the “new, improved” Berger 105 VLD from the new die, after it was polished. Ten (10) Bullets were measured per type. Each bullet was measured three times (3X) around the largest circumference, normally where a pressure ring would be located (some bullets have a pronounced pressure ring, others do not). Columns one and two of the chart show the smallest and largest bullet diameters measured for each 10-bullet sample. The third column shows the extreme spread over each 10-bullet set. Note, these numbers are NOT averages, but represent the “low” and “high” diameters for each set. A Mitutoyo Micrometer was used, zero-checked for each bullet. Share the post "6mm Bullet Diameters — Update"